If you own a business that is part of the food industry, promotions may be one of the most important parts of your marketing efforts. Through these promotions, it is possible for you to increase the brand awareness of your business and most especially the base of your potential clients or customers. Aside from promoting through the use of obvious promotional materials such as a poster, a flyer, and a billboard, why not try out the use of tickets? Before, tickets are commonly used in cinema and theater houses as proof that they have paid and can be admitted to enter the premises. But in this age and time, tickets have already branched out in various graphic design materials that are used for various promotional events. If you are planning to make use of tickets for your restaurant or cafe promotions, we have provided you with food ticket examples and templates that you can use for your business. Hosting a banquet soon? 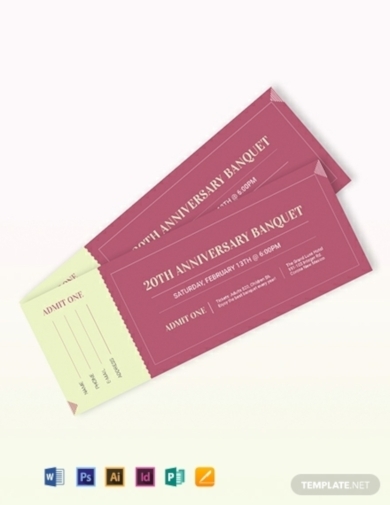 Here’s a food ticket that will make it possible for you to make your upcoming event even more special. With its really simple and clean layout, you make it possible for your attendees to look at it without feeling overwhelmed with any unnecessary design elements. 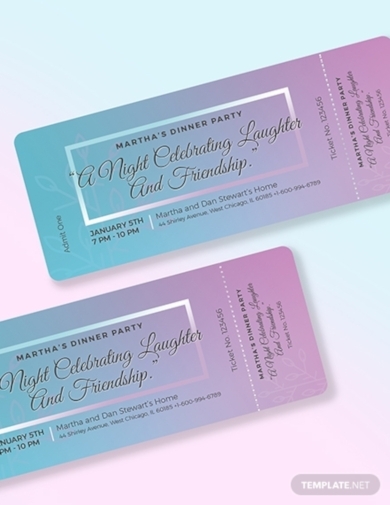 This ticket is also effective if you are planning on organizing a luxurious banquet since it comes with color purple, which is a color that is often associated with royalty and luxury. 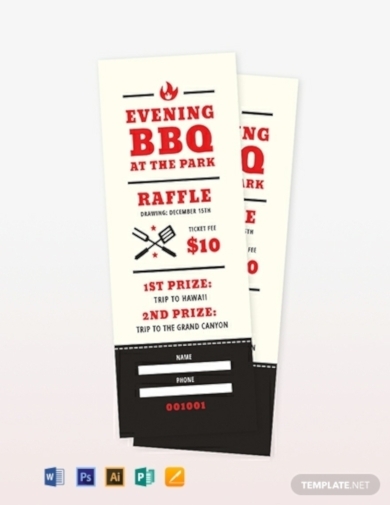 Are you going to organize a barbecue party that includes a raffle event? 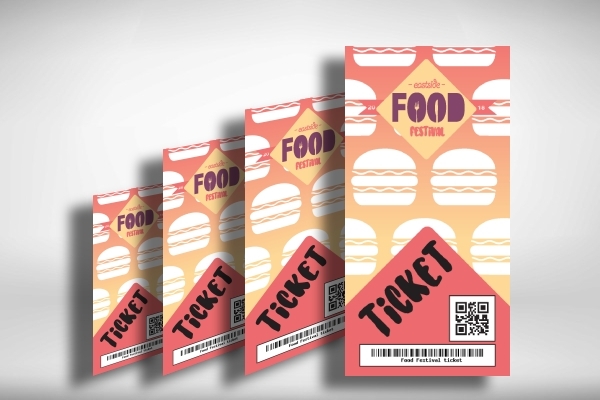 We have found you a food ticket template that is just perfect for your needs. Through this ticket, you will not only be able to give the attendees or participants the chance to win certain prizes, but you will also give yourself a chance to show your creative skills since this template contains a customizable layout that gives you the opportunity to personalize it. 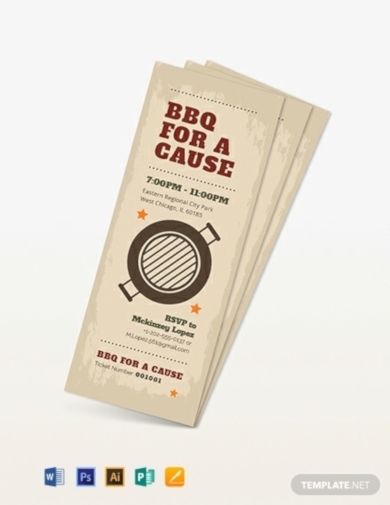 Allow people to enjoy a memorable evening while still being able to contribute to a certain cause with the help of this barbecue fundraiser ticket. This food ticket template contains a really convenient layout that is user-friendly enough for you to edit and customize using various editing software applications from the Adobe Creative Suite and the Microsoft Office Suite. Download this now and start creating your own design. Barbecue cookout parties are undeniably fun to organize especially if you are expecting a lot of guests. But a big number of guests will be a tedious matter to deal with. 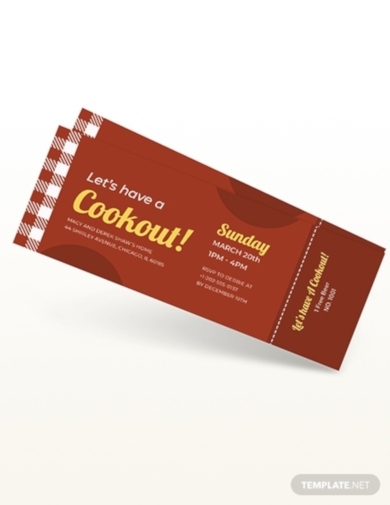 So in order for you to organize a cookout party that is manageable and well-regulated, you may make use of this barbecue party cookout ticket that enables you to manage and regulate no matter how big the number of your guests will turn out. Make exclusive dinner parties even more exclusive by providing your handpicked guests with this dinner party ticket. 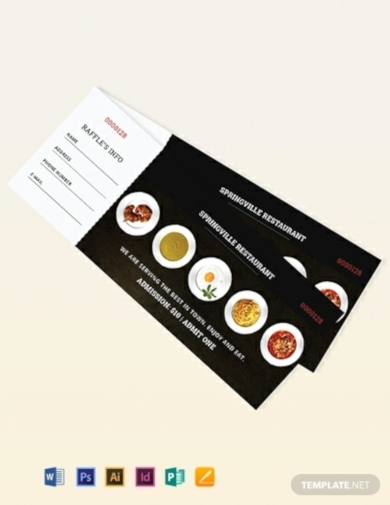 This food ticket template contains an expertly designed layout that is readily customizable. And aside from that, this also comes in various file formats, which means that you can edit this template using various editing software programs of your choice. Be able to treat your clients in class and style with the use of this meal ticket template. By making use of this food ticket, you will be able to provide yourself an avenue where you can serve nothing less than the best food and drinks that you have in store for your customers. With this template that contains a muted color scheme along with an easy-to-read font, you make it possible for you to provide an appealing ticket for your customer. To all soon-to-be newlyweds and wedding planners out there, here is a wedding rehearsal dinner ticket that can help you invite loved ones and guests in style. 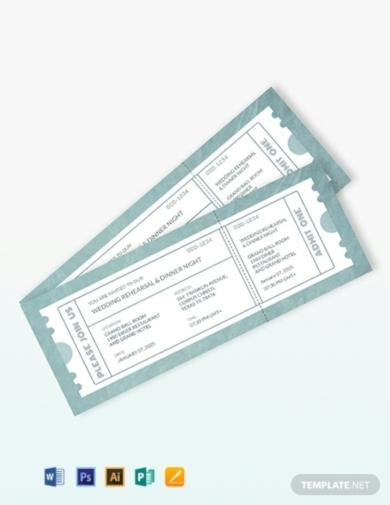 This food ticket will enable you to lose all those pre-wedding jitters that couples, especially the bride, would usually have during the wedding preparations and especially during the wedding ceremony and wedding reception itself because the couple would no longer be worrying about their guests since the tickets can already make them regulated and organized somehow. The love for food brings people together. This is why you can never go wrong with organizing festivals that are centered on food because you will surely have a good number of attendees. This is why, if you are about to organize a food-related festival, do make use of this creative food festival ticket that will surely bring excitement to those who are interested to attend. Being able to help people while still being able to do what they love is perhaps one of the best feelings one can ever have. For example, people love eating food and, as an innate trait, they also want to help other people. And because of this, promotions such as organizing fundraising events where participants would eat the food they like are effective. 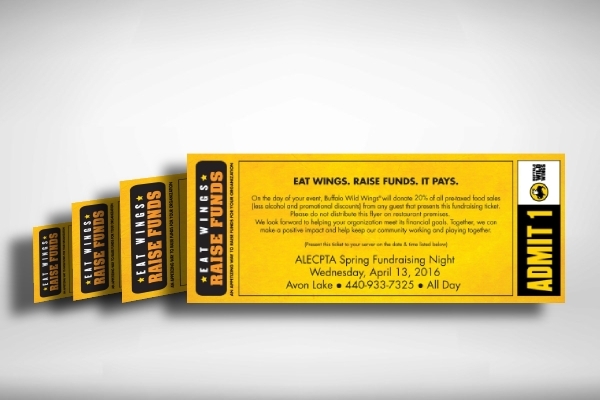 And in order for you to achieve the goals of your cause such as gaining revenue, make use of a food fundraiser ticket like the given example above. Do you own an Italian restaurant? 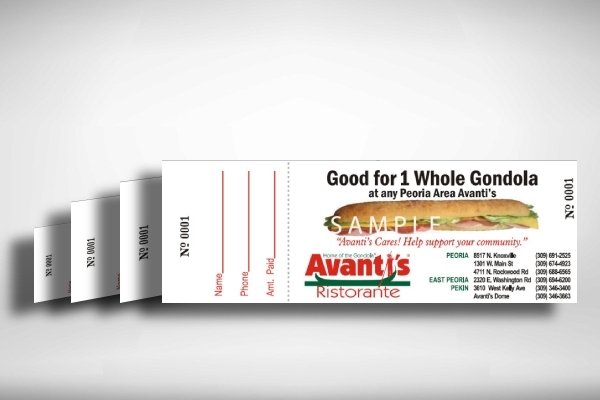 Then here’s a perfect food ticket example that you can get inspiration from for when you will be creating a ticket as part of your restaurant’s promotions. This is especially useful if you are planning to create a simple but effective design for your ticket since this example contains a basic layout that you can easily recreate.